There is a great line and a great tip in the new book, Watching More Racehorses. If you see a horse displaying a certain behaviour pattern it is “well worth while getting down on hands and knees and crawling across broken glass in order to back it”. It doesn’t happen very often. But there was an example today in the Easter Cup. It was an interesting race with five main chances, all pretty much equal favourites around the $4.00 or $5.00 mark. It was easy enough to rule out Manndawi and Transfer Allowance with boots, with the fetlock boot even featuring in the book chapter on Rare Stuff! Doumarin and Rather Heroic were also easy to toss out as unsettled, changing stride and tossing their heads up. Good Value was circling in the yard, a definite no-no. That left five chances: Leebaz, Extra Zero, Guardini, Puccini and Observational. Leebaz had the barrier blanket which is a nice positive and the stallion chain a serious negative, and also had a tongue tie, was gaping and salivating, all quite OK, especially the salivating which is very OK. Extra Zero, the old stager, showed me some teeth, but that’s pretty benign. Guardini had the arched neck, and was prancing and neighing, well roaring really, like a stallion. Do you like your bull stallions roaring? And the two hands of the strapper were a negative! I tried to video it, but the horse had pretty much calmed down by the time it got into the yard and I pretty much failed! Puccini was a clean sheet, and trained by the trainer of the moment, DK Weir. I love clean sheets! Observational had the tongue tie and was gaping, which is also pretty benign. Who would you back if you had to crawl across broken glass on hands and knees? Leebaz took the lead and looked beaten in the straight until Guardini peaked on its run and Leebaz kicked back and nutted it on the line. Observational got third. Puccini finished fourth and Extra Zero fifth. I backed ….? 4. Black Heart Bart: Yawning -30 or +30? Fearful or relaxed? 10. Counterattack: Pawing, winkers -29. Later – Airborne jockey! My final selections: 1,8,6,4. The trifecta in four! Too bad there was too much chaos in the yard to get to air! 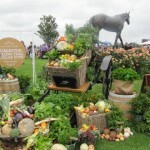 And I noticed that someone had spilled some vegetables around Makybe Diva. 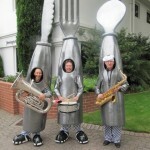 And the cutlery was all there, but no kitchen sink! I am often asked to name the best horse I have ever seen. My off the cuff reply is usually “my last winner”, but after some thought there are several contenders. Commands third to Redoute’s Choice and Testa Rossa in the Caulfield Guineas is a favourite memory. 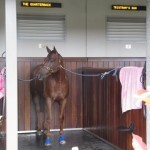 And Persian Punch, the tough English stayer with two thirds in The Cup to his credit, is another favourite. 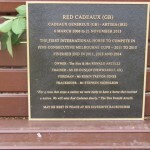 And then you have to admire Red Cadeaux, with three placings out of five attempts. 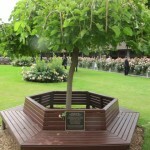 The VRC have recognised his popularity and stuck a plaque on the bench opposite his usual birdcage stall, number 78. Apparently his ashes are underneath. I felt a bit uneasy about sitting on top of him, so I just paid my respects. 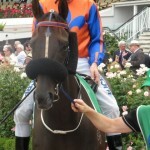 The Kiwi three-year-old colt Xtravagant is all the rage for the Guineas. But out the back he’s just about uncontrollable. Head up, changing gait, cross-over noseband, stallion chain, salivating and letting the old feller hang out. Not my sort of horse. In the yard he doesn’t participate in the parade and does tight circles on the grass. A lay! I get $1.60 the place. The horse rockets out of the barrier but quickly compounds at the business end of the race. I must say, it is immensely satisfying when such a hyped horse goes under after showing such poor pre-race behaviour. And oh, another unusual gear combination. A one-eyed winker and noseroll on Zebrinz. The horse finished fourth. And the best horse I have ever seen? So You Think. And if he had stayed here he could have been anything!